Shocking news out of Fox and the USGA tonight, as it’s been announced that Fox will be taking over USGA broadcast rights, signing a 12-year deal that starts in 2015. The deal covers the U.S. Open, the Women’s U.S. Open and the Senior U.S. Open, as well as international team competitions and amateur events. Quotes below are from the parties involved, courtesy of the USGA release. Will always love the U.S. Open. It becomes a part of you after so many yrs. Our national championship. What a privilege it has been. Johnny: "I feel bad for the USGA that money was more important." Called the news a "big bummer." Poaching someone from Golf Channel: Could Fox go after one of the reporters or anchors that Golf Channel currently employs to head up their broadcasts? It’s certainly possible, especially if someone like Steve Sands wanted to get a little more exposure. The problem with this theory is that if they are only committed to USGA events, it might not be the most sensible way to spend money, but hey, this is Fox we’re talking about. Grabbing some of the NBC staff: NBC doesn’t just broadcast USGA events, so there will still be PGA Tour events on the network, at least as it stands right now. If Fox are only going to do USGA events, would that be enough to intrigue Dan Hicks to jump ship? 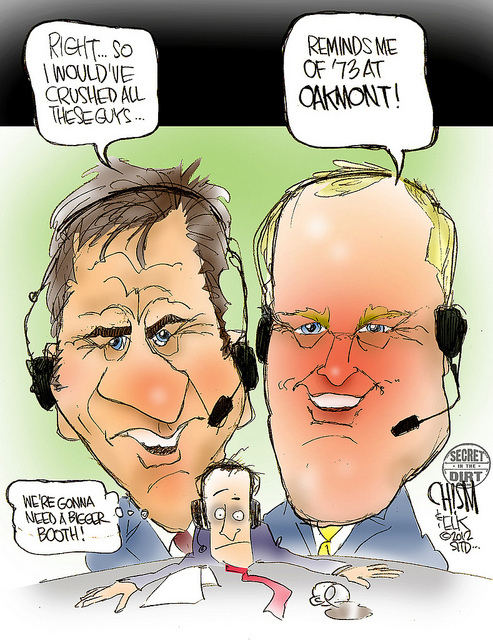 What does this mean for Johnny Miller and other analysts like Roger Maltbie and Gary Koch? Filling the positions in house: Gus Johnson got shoehorned into soccer a little while ago, so it probably makes sense that Fox would at least consider that option, but that is probably something that golf fans would absolutely hate. You think the reaction is bad to occasional work by Miller and Chris Berman? Just wait until Johnson is talking all the time. What about Joe Buck? He is pretty obsessed with the game and you’d think he’d be up for it, and he’s probably more tolerable than Johnson is. Someone new to do the coverage: I don’t think this is impossible, but it seems far fetched. Fox presumably paid a ton of money for this deal, so I can’t imagine that they won’t have either a big name or a seasoned pro handling the assignment. USGA-Fox announcement timing probably had nothing to do with PGA of America's position on anchoring ban. I’m more inclined to believe that money played a bigger role in this, but it’s no secret that the USGA wasn’t exactly thrilled with the push back from both the PGA Tour and the PGA of America regarding the anchoring ban, which, by the way, is still stupid. Shocking: Fox gets US Open from NBC. Not so shocking: USGA announces it on the eve of PGA Championship. Ferguson is absolutely correct on this one though, as the USGA is always looking to make themselves the center of attention. When’s the best time to do that? When an organization that you’re already pissed at is holding their biggest event of the year. As someone who’s been critical of NBC’s coverage in the past, I’m not sure what I should be thinking about this. I’ve always been of the opinion that NBC’s coverage was inferior to both CBS and ESPN, but I’m not exactly thrilled at the premise of Fox taking the reigns here. We’re nearing the end of the Johnny Miller era of U.S. Open coverage, and I’m conflicted. I never thought I’d write those words.